How do we create an artistic video experience about the opening of Tate Modern’s extension while avoiding the pitfalls of turning it into a promotional video? 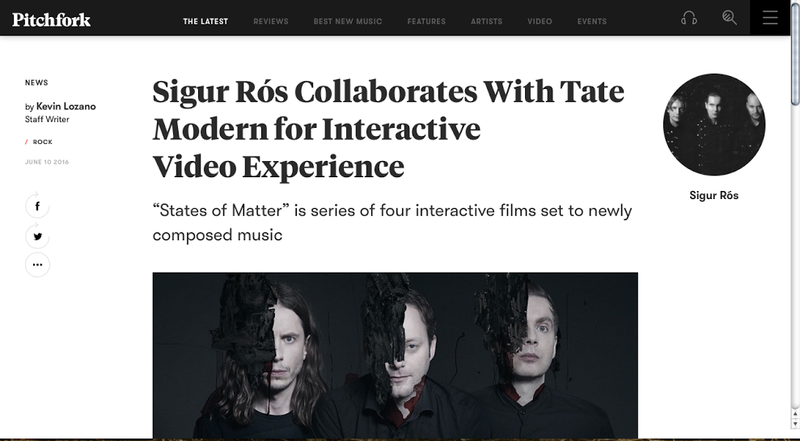 Tate, Sigur Rós, House of Greenland and Phantom collaborated to create States of Matter, an interactive video experience exploring the past, present and future of Tate Modern. Tate approached us for the creation of an interactive video experience under the scope of their TateShots programme. We saw an amazing opportunity to feature the new Tate Modern’s extension in a raw state, before its opening to the public. Through various exchanges with Tate and our good friends at the digital agency Phantom, who agreed to collaborate on this project, we proposed and refined a concept of interactive, multilayered video experience. The experience would revolve around the exploration of the past, present and future of Tate Modern, seen with reference to the history of the Bankside power station that hosts it. The project now had a name: States of Matter. From its inception, we intended the experience to be very musical in its nature. Viewers would be able to activate and deactivate video layers and their associated musical stems. We were aiming for an eerie experience, with dark undertones. We naturally thought of Sigur Rós as a perfect fit for the project, and were absolutely delighted when Orri and Georg agreed to create the track after a short creative discussion. We figured out the storyboard as the music was being developed, in constant collaboration with Sigur Rós and Tate, in order to make sure each stem of the track would explore a specific theme within the overarching concepts of States of Matter. The Liquid track would observe a living fluid in the Drum, in Tate Modern’s extension. The Solid track would parallel archive footage with the lobby of the extension. The Air track would follow mysterious workers and a box in the extension’s upper floors. The Plasma track would explore the shell of the extension through modified drone footage. We visited the busy construction site of Tate Modern’s extension in order to best arrange the shoot around the construction’s requirements. Once everything was sorted, we assembled a dream team to shoot all the footage we would need. We were far from being done. In addition to matching all tracks to the music and to developing the intricate interactive video player, we also needed extensive CGI work on the Liquid and Plasma tracks. Moto were the ones in charge, and did a fantastic job. While we are still in the early days for such an experience, the project already received overwhelmingly positive responses, and was covered by prestigious media outlets. How do we create video series that talk about business and entrepreneurship without being too business-like and corporate? Virgin needed three fresh and edgy videos featuring UK-based businesses on the occasion of #VOOM 2016. This business competition is the world’s biggest and aim to support Britain’s brightest businesses: fourteen weeks of competition between businesses to get a chance to pitch live to Richard Branson. We quickly recommended that Virgin steers away from the tropes of the promotion of entrepreneurship, which tend to rely on a ‘feel good’ atmosphere as we didn’t believe this type of case study to fit the brief. Even with great production value and cast, their safe aspect would have made it hard for them to reach beyond the already entrepreneurially-minded circle. We wanted the videos to be optimistic and depict the considerable energy and perseverance they devote fulfilling their dream. We also wanted to be unexpected: brand comms written like a good show. The objective for Virgin was to position the brand as an inspiration/empower, to demystify entrepreneurship and reboot the brand tone of voice for branded online content. The main objective has been to create a bespoke universe for them and give each video their own identity and tone. A strong collaboration with the companies has been paramount as we had to effectively reflect the spirit of their founders and the way they develop their business on a day-to-day basis. We wanted to portray the businesses’ founders as everyday athletes but with humour and self-depreciation. We were delighted to see that they played ball: each one of them was such a good sport and the shooting took place in a playful and creative atmosphere! This campaign succeeded in changing the tone of entrepreneurship stories and generated very positive reactions online. Discover the three films here.